NYPD Officer Ryan Nash, 28, put an end to Sayfollo Saipov's murderous rampage, the NYPD said. MANHATTAN — The NYPD officer who's been hailed a hero for shooting the terrorist who fatally struck eight people with a rented truck along a TriBeCa bikepath Tuesday insisted he was just doing his job. 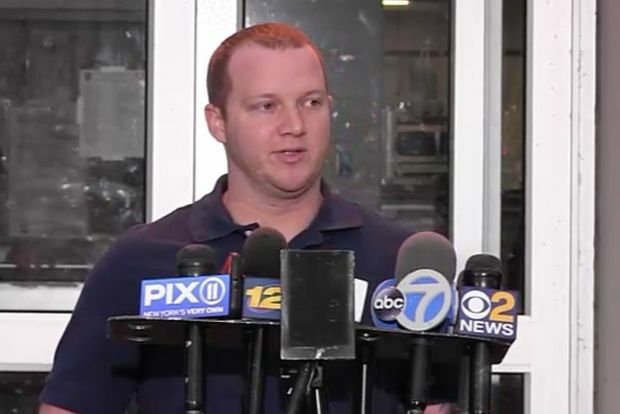 “I appreciate the public recognition of the actions of myself and my fellow officers yesterday,” First Precinct Officer Ryan Nash, 28, said outside his Long Island home. Nash, a five-year NYPD veteran, was responding to a 911 call at Stuyvesant High School near Chambers and West streets when he learned of Sayfullo Saipov’s attack, police said. Saipov, who'd just fatally struck eight people and wounded 12 more, had leaped out of his pickup clutching what appeared to be guns, prompting Nash to shoot the terrorist in the stomach, officials said. Saipov was treated at Bellevue Hospital for injuries that weren't considered life-threatening, officials said. Nash's quick actions drew praise from officials including the mayor and NYPD Commissioner James O'Neill. “He thinks what he did was not an act of heroism,” O’Neill said Wednesday. “I don't think we could find a more humble human being." Saipov, an Uzbeki native, was charged Wednesday with providing support to ISIS and using a vehicle to kill, prosecutors said. Nash insisted he was no hero.